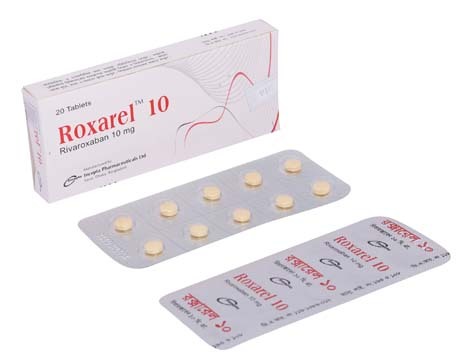 Roxarel 10: Each Tablet contains Rivaroxaban INN 10 mg.
Roxarel 15: Each Tablet contains Rivaroxaban INN 15 mg.
Rivaroxaban is a selective inhibitor of clotting factor Xa (FXa). It does not require a cofactor (such as Anti-thrombin III) for activity. Rivaroxaban inhibits free FXa and prothrombinase activity. Rivaroxaban indirectly inhibits platelet aggregation induced by thrombin. By inhibiting FXa, rivaroxaban decreases thrombin generation. - Treatment of deep vein thrombosis (DVT) and pulmonary embolism (PE), and prevention of recurrent DVT and PE in adults. - For the prophylaxis of DVT, in patients undergoing knee or hip replacement surgery. - Prevention of stroke and systemic embolism in non-valvular AF: CrCl >50mL/min: 20 mg once daily with evening meal; CrCl 15 to 50 mL/min: 15 mg once daily with evening meal. - Treatment of DVT and PE: 15 mg twice daily with food, for first 21 days. After 21 days, transition to 20 mg once daily with food, for remaining treatment. Reduction in the risk of recurrence of DVT and PE: 20 mg once daily with food. When converting patients from warfarin therapy to rivaroxaban, discontinue warfarin and start rivaroxaban when the INR is below 3.0. In case of converting from rivaroxaban to warfarin, no clinical trial data are available for proper guidence. One approach is to discontinue rivaroxaban and begin both a parenteral anticoagulant and warfarin at the time the next dose of rivaroxaban would have been taken. For patients currently taking rivaroxaban and transitioning to an anticoagulant with rapid onset, discontinue rivaroxaban and give the first dose of the other anticoagulant (oral or parenteral) at the time that the next rivaroxaban dose would have been taken. If anticoagulation must be discontinued to reduce the risk of bleeding with surgical or other procedures, rivaroxaban should be stopped at least 24 hours before the procedure. rivaroxaban should be restarted after the surgical or other procedures as soon as adequate hemostasis has been established. If oral medication cannot be taken during or after surgical intervention, consider administering a parenteral anticoagulant. Prophylaxis of DVT Following Hip or Knee Replacement Surgery: For hip replacement: 10 mg once daily for 35 days; for knee replacement: 10 mg once daily for 12 days. Haemorrhage, nausea, vomiting, diarrhoea, constipation, dyspepsia, abdominal pain, hypotension, dizziness, headache, renal impairment, pain in extremity, fever, peripheral oedema, fatigue. Other less common side effects include-thrombocythemia, allergic reaction, syncope, tachycardia, abnormal hepatic function. Premature discontinuation rivaroxaban, in the absence of adequate alternative anticoagulation increases the risk of thrombotic events. 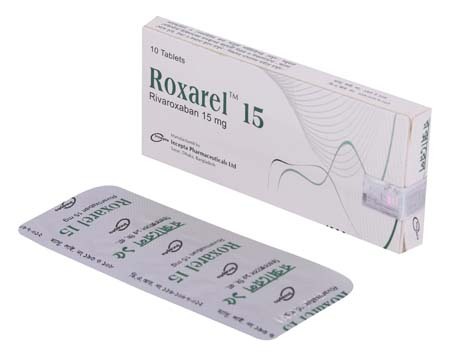 Rivaroxaban increases the risk of bleeding that can be fatal in presence of following risk factors- bleeding disorders, uncontrolled severe arterial hypertension, gastrointestinal disease (e.g., inflammatory bowel disease, oesophagitis, gastritis and gastroesophageal reflux disease), vascular retinopathy, bronchiectasis, history of pulmonary bleeding, Signs or symptoms of neurological impairment should be monitored in case of neuraxial anesthesia (spinal/epidural anesthesia) or spinal puncture as epidural or spinal hematoma can occur. Rivaroxaban is not recommended in patients with pulmonary embolism who present with hemodynamic instability or who may receive thrombolysis or pulmonary embolectomy. Lactation: Safety and efficacy of Rivaroxaban have not been established in breast feeding women. A decision must be made whether to discontinue breast feeding or to discontinue/abstain from therapy. Safety and effectiveness of Rivaroxaban in pediatric patients have not been established.